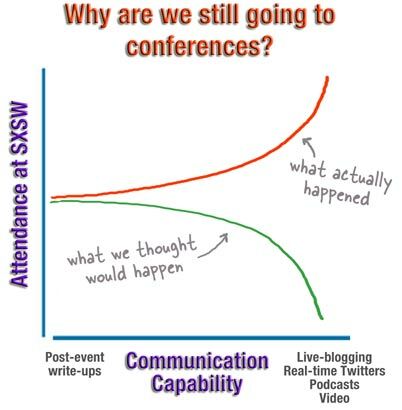 SXSW Interactive had more attendees than ever before. A lot more. But here's the confusing part: the people attending are the same people who create and evangelize the tools that make attending totally unnecessary. I started my keynote by asking if anyone was live-blogging. Hands shot up across the room. Someone yelled "Twitter!" The whole thing was recorded on video and audio. So... if nobody needed to be there, why were they? Lots of people claimed it was all about the side/hallway conversations. But chat and Twitter and all the other non-face-to-face tools are pretty damn good at letting you have conversations. Some said it was for the free beer, but seriously, if you needed to come to Austin, pay a few hundred bucks, and stand in lines just to get a beer, you have other issues. The only logical excuse was for those few (or perhaps more) singles who were hoping for some... action. So it must be something illogical, or rather--some ineffable human thing that defies a simple rational explanation. The point is, face-to-face still matters. And in fact all our globally-connecting-social-networking tools are making face-to-face more, not less desirable. Thanks to the tools y'all are building, we now have more far-flung friends--including people we've never met f2f--than ever before. We now have more people we want to connect with in the human world, often after years of electronic-only contact. All we (and the scientists researching this) know is that there is something we still haven't managed to replicate in a meaningful way, even with the highest-resolution video conferencing tools. One theory is that it has something to do with smell. Whatever it is, it exerts a powerful pull on our legacy brain... a brain that still has no idea we aren't living in caves where human contact and social face-to-face interaction are key to our survival. The most underrated benefit of the face-to-face effect of conferences is INSPIRATION. For me, the single biggest reason to attend an event like SXSW is the feeling of motivation and--as David Seah so aptly put it -- "Rededication". Almost everyone I talked with at SXSW said they were newly inspired. Was it from the ideas they were hearing in the sessions? Some of it, sure. But again, those same ideas are going out to everyone with a browser. No, there's more to it. There's mirror neurons, for one thing, and the effect of emotional contagion that happens when you're around a pile of people who share the same interest and enthusiasm. Everyone comes out re-energized. And you don't need to go to SXSW to get that benefit! Simply attending any live event--from the three-person lunch meetup to the 100-person local user group can give you the most positive effect of being at an event like SXSW. 1) We should encourage our (human) users to get together in the offline world. 2) We should add more human-ness to the interactions in our software. In this post, I want to mention a few ideas for the first one. Get your users to meet other users in the real world! Where there is passion around an activity or product or service or cause, there are always people wanting to connect with others who share that passion. The more we can help put our users together with one another offline, the more likely we are to get--or increase--user passion. 1) Put together a "How To Start A Local User Group or Club" document. User group meetings often start or end with prize drawings; give the user group leaders plenty of swag for the meetings. It'll make the leaders look good, etc. Sun puts JUG (Java User Group) leaders on a pedastal--helping them promote their groups, giving them special receptions at the annual JavaOne conference, etc. (Or a related book club.) Collect advice and lessons from other existing groups. Provide a list of suggested books to read, and 6-months' worth of topic plans. For example, "Month One: read [insert book related to your domain], and have each attendee discuss the following key points..."
5) Hold a very low-cost annual weekend conference. Make it ridiculously easy for people to get there. Find sponsors to help. Even better if you hold several mini-conferences a year, in different locations. 6) Encourage users to start a local BarCamp (or other *Camp). Direct your users to the BarCamp Wiki where they can learn how to do it. 7) Use Meetup.com as a resource! 8) If you already have online user forums, enlist moderators to try to form an offline meetup. This is often one of the best places to start. 9) Hold special cocktail receptions/parties for user group leaders at industry conferences in your domain. 10) Advertise/promote your user group events on your main page! Remember, passionate users MUST connect with others who share that passion, so this is not a nice-to-have... it's an essential part of any product, service, or cause for which people are passionate. Bottom line: Face-to-Face matters, and the more people we meet online, the more people we now want to connect with offline. Perhaps one day in the future, the technology will finally catch up with real-life and we'll get the same brain/health benefits from a non-real-world experience. Personally, I hope not. I'd rather see technology that lets us come together in the real world as cheaply and easily as possible, despite wide geographic distances. And to all who bothered to come to my SXSW talk when you clearly didn't need to, I so SO much appreciate it. I've only recently been speaking at conferences, but I've been attending them for almost 20 years like a junkie. And I don't even go to the parties. I go because I always come back motivated, even by the things I had begun to take for granted. You don't need to go to SXSW to take advantage of the ideas there... just read the coverage and listen to the podcasts. But to get the real benefit of SXSW without being there, find a local group of people to meet up with! Even if it's three people having a coffee morning, it's important. A lot more important than most of us twittering, IM'ing, blogging, video-chatting folks like to acknowledge. » Incontrarsi vs tecnologie di comunicazione a distanza from SKY TG24 "Reporter Diffuso"
October 2007, a group of artists only known to each other online will be meeting for a weekend "retreat". Why? I don't really know exactly. Why is it that travel-phobic me is willing to fly half-way across the country to have face time with people I've never met in the flesh before? And why is it that I'm praying that this will be the "first annual" and not the "first and last"? Obviously there is something transcendent in face to face, but I don't know exactly what it is. I couldn't agree more about the need for more offline interaction. I've been feeling this more and more in the last few months, and your keynote at SXSW (and the conference itself) really made it clear to me. The Internet really is just a tool, a means to connect people, not something great unto itself. I listened to your talk at SXSW. As always thought-provoking especially about the importance of getting together face to face, and the WTF button. Whenever I listen to one of your talks, I feel like I'm only getting a small part of what you're saying, because I can't tell what's on the slides. I'm missing the party, everyone around me is laughing and I don't know what it's about. Any chance you'd consider posting them somewhere for those of us who didn't make SXSW?? Face to face meetings are going away just like paper went away with the advancement of technology. We use more paper today than ever before. I was the one who yelled "Twitter." We're doing a TwitterClub Beach Party in Half Moon Bay on June 16th. You're invited! TwitterClub Beach Party in Half Moon Bay in June... dim glow of laptops in the fog, condensation obscuring vision as geeks stumble around peering through their spectacles trying to find the porta-potty, out of towners wishing they'd dressed for fifty degree damp weather. Your talk at last year's SXSW nearly caused my head to explode -- really a landmark moment for me in terms of how I size up projects and set goals, right from the outset. Very much enjoyed your keynote this year, too -- I help build sites for users that generally are nowhere near the edge of the adoption curve, and I'll never put up another new tool (like RSS feeds, for example) without picturing those suffering users' faces -- and then makign a screencast or somehting that makes it real clear. 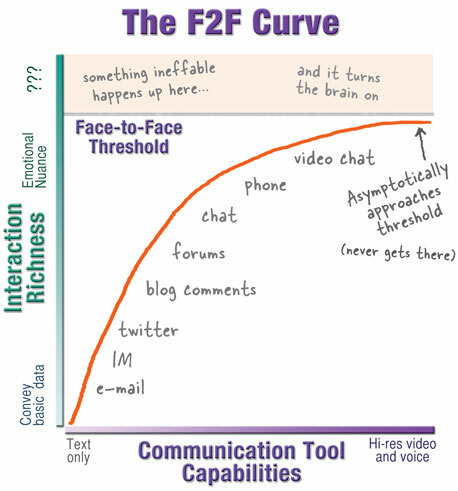 This is a great post, but do we really need to be told that face to face communication is best? How long has e-mail abuse been going on for? I WISH could have been at SXSW. Next year I'll try harder. Twitter wasn't a substitute for me, but it did make me feel like I could still be a part of it somehow. And I even listened to your keynote because the link was sent through Twitter. Yes, it's not a substitiute for human contact. Nothing is. But it's nice to have technology that let's us feel close even when we can't be physically. Good post as always. I regularly attend local SAS user group meetings here in Melbourne, which I enjoy. The only gripe I ever have is that too often it feels like I've stumbled into a Sales pitch for expensive products I'm never going to get my hands on, rather than a technical user forum. SAS also does some wonderful International user group meetings (SUGI) each year, which I've heard are fantastic to attend, however, they're always overseas (expensive to get to from Australia) and tickets are always very expensive too (over $1000). While they seem to understand the importance of having a user group, it almost feels like it's targeted at someone else, not me. Even with all that though, I still frequently come back from our quarterly afternoon meeting with some new ideas. I think what the face to face meetings have which all the other media lack, is the emotional impact. If someone is passionate about a topic, you can get carried along with it, which is MUCH harder to get from something you are reading on a computer screen. Meeting people f2f carries so much more information than any other form. It is the same difference between a true motivator (a life human beeing) and any of the motivational posters. FP: after a few shots of whiskey you forget all about your computer, the fog, the cold, and the person sitting next to you starts to look damn attractive. Either that, or you start to sing stupid songs around the camp fire. The face to face aspect of conferences is great, certainly. I find that I learn better from a live speaker than by reading the transcript. But the biggest difference between going to a conference and reading about it after the fact is actually in my own head. The process of getting out of the office (and probably the state) really helps me get into a state where I can concentrate on the topic at hand. It keeps the daily parade of artists and designers away, and even distances me from less intrusive distractions like email and IM. Without those distractions the great talks really pop out at you. I've come away from every GDC with something that made the whole trip worthwhile. Face-to-face is _very_ rich media. It's about what I call the "bonding" conversations. Before the bonding conversation you know someone superficially. After the bonding conversations (and no I don't mean the hook-up type of bonding) that person means something more to you. You see a bit of their motivation/personality/themselves and they become a real person to you - no longer their blog/twitter persona. It must also be about seeking out networkable colleagues for private networking and dealmaking. Also, most conference speakers are offering the same information on their blogs or whitepapers. "3) Treat your user group leaders like royalty"
I know everyone in the room was thrilled to have you there... including myself. So true - blogging etc. is more of a means than an end. I'm off to coffee this morning with lots of interesting people I'd never have met without my blog. I saw your reference to Coffee Mornings. We Account Planners have got organised on a global scale! The Coffee Morning phenomenon has really taken off and takes place weekly in London and regularly in Jakarta, Key West, Eugene, Bankok, Scandinavia, Chicago, Brighton, Sheffield, Bucharest, Portland, Dallas, Toronto, Kansas City, NYC, and Sydney (phew). Sometimes its more beer-in-the-evening than an actual coffee morning but thanks to the internet, a group of people who tend to be in the minority in their agencies can get together and feel part of something bigger, sharing insight, helping each other out and having a good chat along the way. As Russell Davies (who kicked the whole thing off as far as I can tell, www.russelldavies.com) would say, splendid. Kathy, I can't help but notice the similarity between your first graphic and Hugh's "The market for something to believe in is infinite" cartoon, should we read anything into this? How true... a previous job at a 15-man engineering shop, I was fortunate to be able to go for 3 years to the huge (~2000 attendee) user conferences for the mini-industry we served (OSI PI - a data historian). I have always thought blogs (that's as much as I do - not of this crazy "twittering") had their place in interacting with others but never replacing what face-to-face provides.